Is South Korea Looking to Capitalize on Macau’s Slumping Tourist Appeal? With casino revenue down across the board in China’s Special Administrative Region of Macau thanks to intense anti-corruption campaigns by Beijing, the door is open for other Asian gambling hubs to rapidly increase market share and revenue in the extremely competitive gaming industry. With this information in mind, South Korea is looking to continue its growth into a more attractive gambling destination for both foreign tourists and high-rollers. On the heels of a March 2014 decision to approve construction of the nation’s first foreign-owned casino resort, the home of Asia’s fourth-largest economy has now released word on the imminent approval of two more casino resorts, as well as approximately 5,000 new hotel rooms, this year. 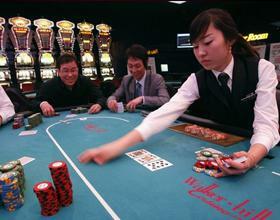 South Korea estimates that the new casinos could provide a major boost in tourism in the coming years. The rapidly expanding Chinese tourist market is driving the leaders of surrounding countries to create and improve destination cities in order to capitalize on the huge revenue potential. If South Korea approves the new construction, the country will hand-pick operators, who will be expected to invest around one trillion won ($926 million) each into the two integrated resort complexes and foreigner-only casinos by the second half of this year. The new construction plans are, reportedly, the beginnings of a three-year plan to boost the country’s economy. Last year, South Korean officials approved the construction of two casino resorts in the city of Incheon, which is located approximately 17 miles (27 km) from the country’s capital of Seoul. A consortium of U.S.-based Caesars Entertainment Corp. and Lippo Ltd. of Hong Kong will undertake the construction of the initial gambling, hotel and shopping project, which was granted preliminary approval for Phase I construction last year. A joint venture between local company Paradise Co Ltd. and Sega Sammy Holdings, Inc. of Japan is leading the construction of the second currently approved resort. The gaming boom doesn’t stop in Incheon, however. An additional consortium is seeking approval to break ground on an integrated resort project on the island of Jeju, which is already a hotspot for Chinese tourism. The addition of four new duty free stores in Seoul and Jeju are also aimed at capitalizing on the country’s thriving tourism industry. South Korea currently has 17 casinos, with 16 open only to foreign visitors. Revenue in these casinos increased by an average of 15 percent per year for a five year period ending in 2012, and the country is looking for continued growth in the coming years. The new projects will be the first to offer resort-style amenities, such as spas, restaurants and shows, to gamblers in the country. In 2014, the number of Chinese tourists to visit South Korea increased by nearly 41 percent, according to reports released by the Korea Tourism Organization. A growing number of casino resorts is expected to bring an even larger explosive growth to the country’s tourism revenue in upcoming years. With Mainland Chinese tourists currently flocking to international destinations to take advantage of gaming away from the watchful eye of Beijing, Asian tourist destinations are racing to absorb a piece of the one of the world’s most active tourist populations.